Adapted from Reif Larsen’s novel, The Young And Prodigious T.S. Spivet is a vibrant and amusing, if ultimately convoluted cross-county adventure from Amélie director Jean-Pierre Jeunet. Wise beyond his years T.S. 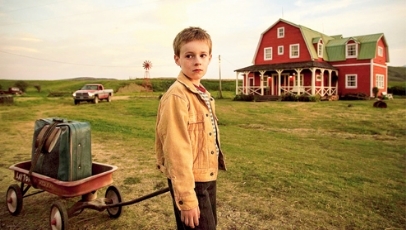 Spivet (Kyle Catlett) lives on a remote ranch. When he’s invited to the Smithsonian to collect an award for his perpetual motion machine, he flees his family – and the sorrow of his brother’s accidental death – and hitches a ride on a freight train. The Young And Prodigious T.S. Spivet is a delightful and visually resplendent film that makes excellent use of its 3D. It’s well acted, particularly by newcomer Catlett, and adorned with a few neat touches that magnify Spivet’s overpowering imagination. What weakens it, however, is Jeunet’s exploit of quirk for quirk’s sake in relation to the characters and the real issues they face. This renders many of the films attempts at drama over-sentimental. A vexing final act, too, with an over-the-top performance from Judy Davis, brings the film to an unfortunate close.